WASHINGTON, Feb. 06 /CSRwire/ - Emerging technologies are rapidly changing how companies prevent pollution, keep employees safe and set sustainability goals, according to a report published today by the National Association for Environment, Health and Safety, and Sustainability (EHS&S) Management (NAEM). “The EHS&S Tech Transformation” report profiles the internet of things (IOT) technologies that are taking hold among leadership companies, explains what they mean for EHS&S management and showcases how companies are putting them to use. The report also includes new analysis of NAEM survey data from 79 companies on emerging practices and technologies. 77 percent of respondents are using or testing mobile devices and apps to interface with employees, conduct audits and log incidents. 31 percent of respondents have introduced or are actively evaluating the use IOT tools such as smart sensors and wearable sensors. 20 percent of respondents are using or evaluating artificial intelligence tools such as machine learning natural language processing. 14 percent of respondents are using drones to assist with activities such as inspections and compliance monitoring. To leverage the volume of data these devices create, 38 percent of companies are using business intelligence tools and predictive analytics in their program management, NAEM found. 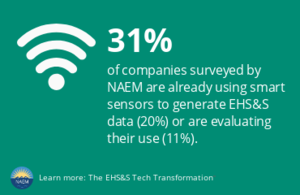 To download the full results, visit https://www.naem.org/what-we-offer/research/reports/read/ehs-s-tech-transformation. The National Association for Environmental, Health and Safety, and Sustainability (EHS&S) Management (NAEM) empowers corporate leaders to advance environmental stewardship, create safe and healthy workplaces and promote global sustainability. As the leading business community for EHS&S decision-makers, we provide engaging forums, a curated network, peer benchmarking, research insights and tools for solving today’s corporate EHS&S management challenges. Visit NAEM online at naem.org.